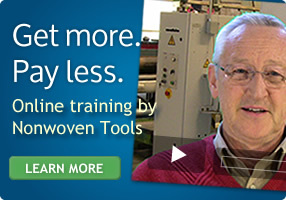 Several nonwoven production methods use staple fiber. 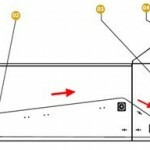 Primarily, these are processes that use cards or airlaid machines to form the nonwoven web. 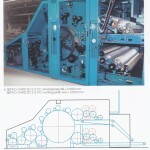 One of the methods for introducing bales of staple fiber into the nonwoven machine is to use balefeeds. Some call these hoppers. Their purpose is to tear up the bales of fiber into small tufts about the size of plum or smaller. These balefeeds have a device to lift the bales (01) into the storage area of the balefeed. The storage area has a movable floor called an apron (02) that carries the bales to a vertical conveyer (03) that is covered with spikes. The conveyor tears off chunks of fiber and carries them upward until a spinning roll, called a stripper roll (04), knocks most of the fiber off the spiked conveyor while allowing a measured amount to continue over the spiked conveyor. A doffing roll (05) then knocks all the fiber off the spiked roll. 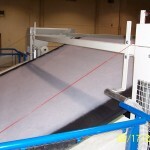 The fiber can fall onto a collection conveyor and this is called volumetric feeding. 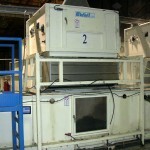 If the fiber falls into a collection pan that is connected to a scale, it is call weigh-pan feeding. 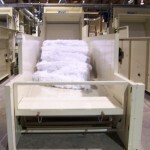 A newer method is to allow the fiber to fall onto a small conveyor attached to scales and this is a method of continuous weighing. 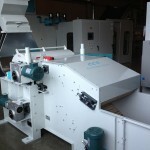 After leaving the balefeed the fiber will be subjected to further opening and blending in various machines.